With GIS, customer care staff can pinpoint customer reports—such as low water pressure, leaks, and service outages—on a map. On the European archipelago of Malta, located in the Mediterranean Sea south of Sicily, the Water Services Corporation (WSC) is the public entity in charge of drinking water and wastewater. Ensuring that water continues to flow on the country’s three inhabited islands—regardless of population growth, increased tourism, and other seasonal demands—requires substantial infrastructure, sophisticated technology, and steadfast organization. That is why WSC has adopted an enterprise-wide geospatial strategy, steeped in ArcGIS, to make location data central to decision-making. Since WSC migrated its GIS over to Esri software five years ago, the organization has built up a comprehensive enterprise GIS. It has geolocated all the islands’ water meters, valves, taps, and pipes for both drinking water and wastewater. The corporation has also recorded the slope angles and elevations needed to design and maintain efficient and well-functioning systems. WSC’s enterprise GIS allows a large number of employees throughout the organization to use, manage, and share geospatial data. 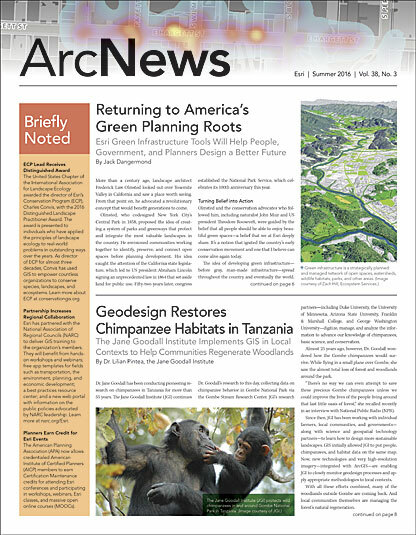 They can create, modify, and visualize GIS data, as well as analyze and disseminate it. Incorporating GIS at nearly every level of the organization allows strategic operators at WSC to see, question, analyze, and interpret data so they can better understand relationships, patterns, and trends in Malta’s water systems. To fully benefit from GIS and maximize its return on investment, WSC came up with a long-term strategic plan for implementing the technology. This involved placing GIS at the core of each existing and new solution and making the technology the bridge between all systems. 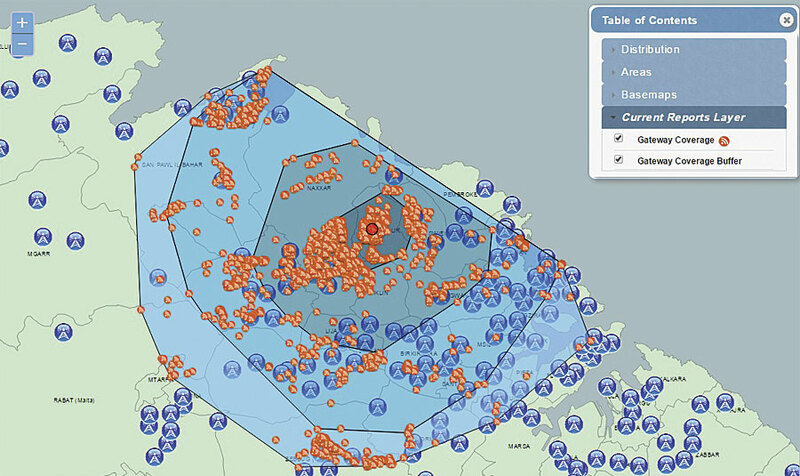 “Esri has made the sharing and accessibility of GIS data layers and analysis limitless,” said Ian Galea, a GIS technologist at WSC. Now, nearly the entire utility is GIS centric. Keeping WSC’s 420,000 water and wastewater customers happy is paramount. To that end, the corporation has integrated ArcGIS with its SAP enterprise resource planning (ERP) system to better administer key business functions, including asset and supply chain management, accounting, and finance. The reception area for every smart meter transmitter is periodically analyzed to make improvements in coverage. With the ArcGIS-SAP integration, WSC’s customer care department can pinpoint customer reports on a map, including those for low water pressure, leaks, and service outages. Department staff enter the information into SAP ERP through an in-house-developed GIS app called AquaDot CRM (customer relationship management). This sends an automatic, georeferenced notification of the problem to the relevant region’s WSC officer in charge, enabling him or her to quickly see where the problem is on a map. With GIS, searching for streets and verifying specific locations is much easier as well—especially when customer reports come in over the phone. Call center personnel can use orthographic map projections and street-level views to confirm a reported location by giving visual cues to the customer. This ensures that reports and repairs get dealt with smoothly. Using feature layers and geometry services from ArcGIS for Server, WSC can keep track of smart meter system components—namely, the RF receiver gateways and meter module transmitters. Employing the visual aids in AquaDot AMM, users at WSC can rapidly identify the location of a particular RF receiver gateway (which captures hourly meter data) when its alarm goes off, which could indicate a low battery, for example. They can also quickly locate meter transmitter issues, such as cut wires, so the corporation can issue repairs straightaway. WSC uses the solution to monitor the radio reception between smart meter transmitters and receivers as well. The reception area for every transmitter is generated on demand and is periodically analyzed using the appropriate geometry services (which help apps buffer, calculate areas and lengths, and do map projections). This analysis flags any negative variations in transmission, which can indicate antenna problems that need to be fixed. Examining stored reception areas with GIS can also identify overlapping reception zones, which reflect redundant antennae. Since antennae are costly to maintain, this helps WSC promptly remove the nonessential ones. The AquaDot AMM solution shows WSC which gateways serve specific consumer meters over time. Additionally, the AquaDot AMM solution shows WSC what gateways serve specific consumer meters over time so the organization can ensure that all consumer meters are being reached and that hourly data on water use is being received and processed. Users can select a particular antenna as well to visually analyze which meters have been serviced within a specified period of time. This ensures that all smart water meters are recording data on water usage for supply and billing purposes, as well as data integrity reasons. AquaDot AMM also helps administer transmitter installations and maintenance, aiding personnel in locating meters that need transmitters to be installed or inspected. Another central function for WSC is maintaining and extending the country’s sewage pipe network. To manage projects like these throughout their life cycles, the corporation developed the AquaDot Projects system. At the outset of any planned project, the regional network infrastructure department geocodes all the assets that will be used or affected—mainly pipes and other fittings. Any attributes related to these assets, such as pipe diameters and material types, are also stored with every geocoded feature. In the year that WSC has been using this project management system, it has become easier to identify concentrations of sewage pipe projects. Using heat maps, project planners can see areas that will likely need pipe replacements soon and evaluate areas that may require network expansions. Moreover, using tools in ArcGIS for Desktop to calculate pipe lengths and identify new service points in and around project locations has made the planning process much more efficient. To help management keep track of these numerous and varied projects, WSC also developed AquaDot Insight, a business intelligence solution that uses data gathered by various solutions, such as SAP, to produce high-level reports and key performance indicators. With user-friendly, GIS-based dashboards (developed in-house), managers can evaluate trends and make quick, effective decisions. 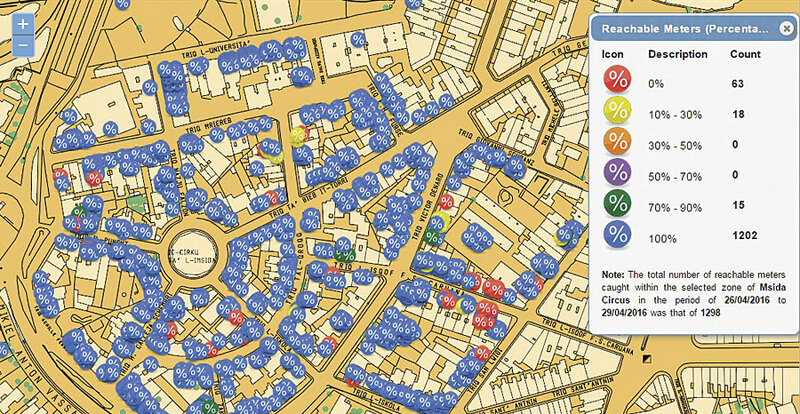 One dashboard, for example, provides managers with a visual display of how many consumer transmitters have been installed in every locality in Malta. Another dashboard shows heat maps of customer notifications by type or service-level agreement. These help departmental and top-level managers at WSC monitor the status of installed meter transmitter modules by location. WSC has infused all of its key business functions with GIS. This required the corporation to take the time to understand its GIS needs, select the right technology, and establish implementation milestones to measure progress. By maneuvering so carefully, WSC has optimized its operations, reduced risks, and advanced decision-making—all of which contribute to delivering its customers the best service possible. 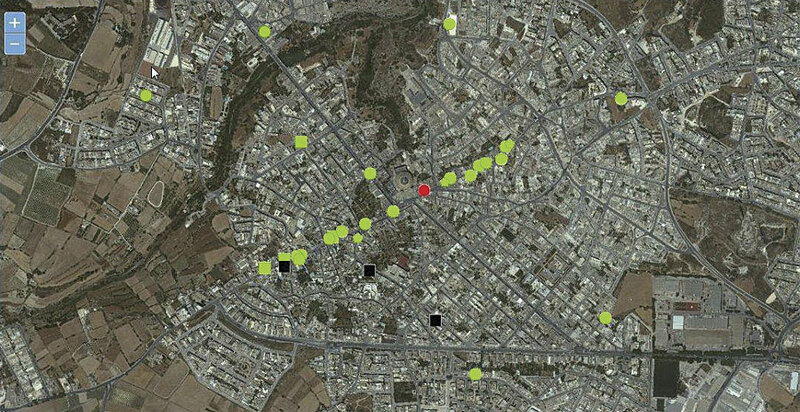 Malta’s Water Services Corporation won a Special Achievement in GIS Award from Esri in 2016 for its effective implementation of an enterprise GIS solution.